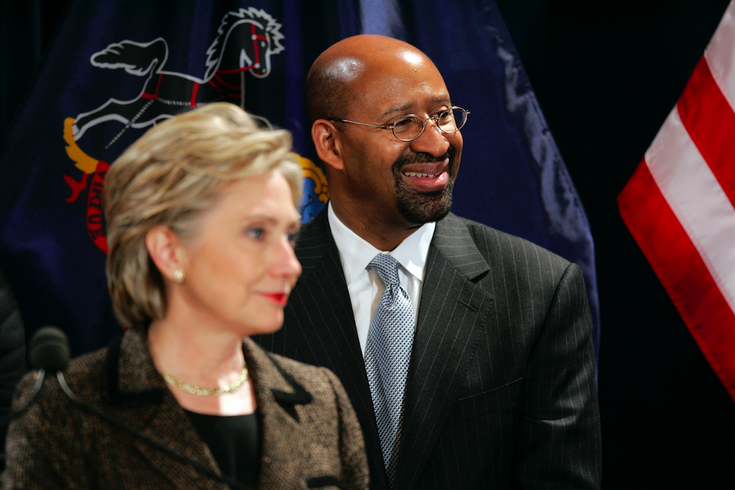 Philadelphia Mayor Michael Nutter is seen with Democratic presidential hopeful, Sen. Hillary Rodham Clinton, D-N.Y., at City Hall in Philadelphia in this Jan. 23, 2008 file photo. Nutter, who endorsed Clinton in December while she was the front-runner has not wavered in his support for her. Former Philadelphia Mayor Michael Nutter has seen no shortage of job opportunities since leaving City Hall — CNN, University of Chicago, Columbia University, Dept. of Homeland Security — and if Hillary Clinton is elected president in November, he may be poised to make a leap into the White House. In a largely speculative "insiders" report from Politico, Nutter is mentioned as a leading candidate for two cabinet positions in a hypothetical Clinton administration. First, Nutter is noted as a possibility for transportation secretary, a post he was considered for in 2012 after President Obama's reelection. Second, he could be up for housing and urban development secretary because "Clinton and her aides are thought to be interested in emphasizing cities and drawing on urban experience." In retrospective reviews of Nutter's tenure in Philadelphia, he's been widely credited with improving the relationship between SEPTA and government agencies to solve logistical and maintenance issues pertaining to public transit. Last fall, the Nutter administration secured Philadelphia a $10.2 million TIGER grant from the Department of Transportation to support a total of $35 million in infrastructure improvements. His advocacy for greater bike accessibility and the launch of Indego's bike-share system also appear to have carried momentum into the Kenney administration, which plans to install new protected bike lanes throughout the city. On housing and urban development, Nutter led Philadelphia to its first comprehensive zoning reform in 50 years, expediting the timeline of projects and allowing neighborhoods greater flexibility to adjust proposals in line with community needs. In the long-run, his Planning Commission's Philadelphia2035 citywide vision laid the groundwork for "smart" development principles seen in the recently launched Smart City Challenge. It's a bit more difficult to assess Nutter's record on public housing. In 2011, HUD actually took the Philadelphia Housing Authority into receivership amid internal discord and the shaky aftermath of former Mayor Street's Neighborhood Transformation Initiative. PHA returned to local control in April 2013 after HUD cemented a recovery plan. Nutter, at the time, gained direct experience mediating an urban crisis in a major American city with a federal department. "With PHA's return to local control, the city of Philadelphia has the opportunity to better coordinate housing policy, related investment decisions and neighborhood revitalization in a transparent and coherent manner that involves all housing agencies and stakeholders for the benefit of the people who live in PHA housing and all Philadelphians," Nutter said at the time. Since Mayor Kenney took over, PHA has poured resources into reinventing the Sharswood neighborhood of North Philadelphia and the long-incubating Land Bank has taken some important steps forward. For years, Nutter has been steadfast in his support for Hillary Clinton. Although Politico's report is pure conjecture, his loyalty and willingness to dispense honest advice to Clinton over the years could plausibly give him an inside track to the helm of a federal department.